Since I’ve been comparing major news sites in variety of areas (Facebook and Twitter impact; YouTube and new Digg activity; site speed and domain authority, among others) I thought I’d look at overall social media engagement too. Adam, great analysis! I’m really surprised only 4 “new” media made the top 30: Yahoo, Huffington, Slate, AOL. 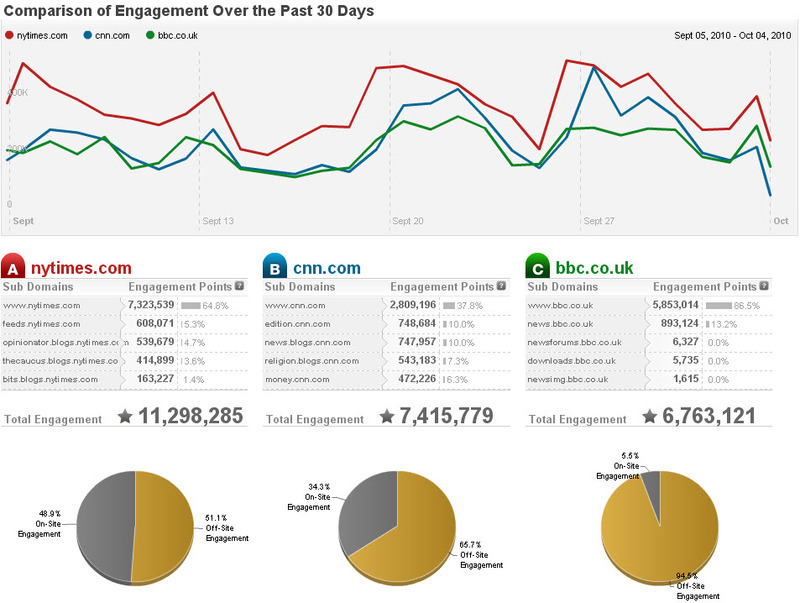 You’d think engagement would be way higher than with “old” media. Also surprised how well some magazines did. In many ways it’s encouraging that great content may be winning over readers/viewers and engaging them presuming there is no hidden bias in PostRank. Thanks for your post. Thanks Jeff. To clarify my methodology, I chose 30+ sites with a mainstream/national news focus, making effort to include a cross-section of newspapers, magazines, TV, Web-only etc. So there may definitely be some other new media sites with engagement scores that are competitive with this group, or even higher. But I left out sites like Mashable and TechCrunch that have a more specific content focus. Adam, great stuff! To your point about also taking the size of the audience into account, just posted some extra analysis on our blog. The engagement per unique and visitor numbers are very interesting metrics that we use often at PostRank, because they highlight very well the differences in the effectiveness of the sites’ social strategy and execution. Great follow-up analysis Ilya. 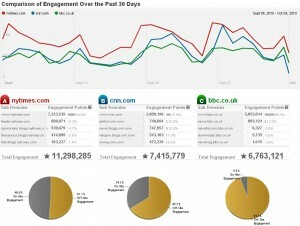 Looking at engagement per visitor/unique is a good idea and sheds more light on each site’s effectiveness. Thanks for sharing. Hi Adam, I think PostRank under-counted msnbc because the site’s true domain is msnbc.msn.com. Looking at the unique users in the raw data, msnbc.com is listed with 1.9M, but it consistently ranks in the top 3 news sites in unique users along with CNN.com (listed at 25M) and Yahoo News. Cory, good catch. Not sure if Adam factored in the msnbc.msn.com subdomain when he got the engagement number, but I know I certainly didn’t take it into account when fetching the data from Compete (which unfortunately, requires a subscription to get at subdomain breakdowns). Adam, if its not too much trouble, do you mind sharing (or emailing me: ilya at postrank.com) the list of domains you used to fetch the engagement numbers? Want to make sure we’re comparing apples to apples. Cory/Ilya, I did wonder about MSNBC actually. First I ran it on msnbc.msn.com but that figure was very low (re-running that one today shows a total engagement score of just 2,712). Running it on msnbc.com provided the higher score above (today it’s 86,083), but that is also quite low. Maybe since msnbc.com redirects to msnbc.msn.com that is causing an issue. MSN.com has a total score of 4,083,019 today, but since there is more on MSN than news I opted not to use that. Great analysys, thank you for sharing. I wonder how one can measure the quality of the engagement.